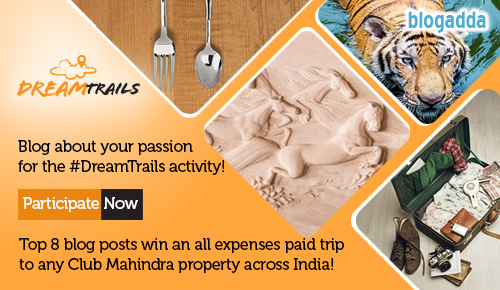 Blog for Club Mahindra Dream Trails and win an all expenses paid trip! Your blog for the #DreamTrails activity can win you an all expenses paid trip! “I have a dream…”- Martin Luther King’s historic lines find resonance with all of us. Our dreams might not be as lofty or earth shattering as him, but dreams all of us do have. Each of these dreams have a story or history attached to them and we’re never really at peace till we fulfill them. BlogAdda in association with Club Mahindra presents the #DreamTrails activity that will take you right into dreamland, and who knows, you might just come back with your dream fulfilled! Our dreams and passions are what make life exhilarating for us, making us feel happy, fulfilled and ALIVE. All our lives, we work with the goal of making at least some of our dreams come true. Not any more! We’re making your dreams open up their arms to welcome you through the #DreamTrails activity. Blog about your dreams in the areas of Travel, Food, Art, Culture, Nature and Wildlife. Tell us what you are passionate about when it comes to these aspects of life. Is it being in a strange land that inspires you? Always dreamt of sampling an exotic cuisine? Is your camera yearning to capture the elusive tiger in its natural habitat? Or is it ancient architecture that makes your heart sing songs of the glorious past? Whatever passion is closest to your heart, we want to hear all about it! 4. The last date for submission of this blog post is midnight, 2nd August 2016. 6. Post at least 1 tweet tagging @blogadda and @clubmahindra, with the hashtag #DreamTrails and share the tweet URL in the form. We’d also love it if you follow @blogadda on Instagram and post your best photo related to Travel, Food, Art, Culture, Nature or Wildlife, tag @blogadda and use the hashtag #DreamTrails. Your blog will surely have given you a lot of happiness over the years. Now use it to give wings to your dreams too. 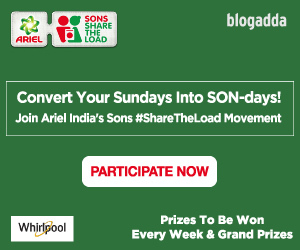 Participate before time runs out! Question: Is this contest available to United States residents? @Justin. Thank you for expressing your interest. Unfortunately it is only for Indian Residents. we d have to write about a place where we have visited or a place we dream to visit soon and feelings about it? So, we can write a dream story in any one aspect like Travel, Food, culture or incorporate all? Any would do right? Should we write a blog about a place that exists in reality or it could just be something that exists in our imagination, like a dream? Will these holidays be for couples of individuals? Hi, Is it possible to edit the tweet url submitted with the form? Just realized the blog link within the tweet doesn’t work. How can you call it an ‘All Expenses Paid trip’ when the basic needs such as Lunch and Dinner have to be paid by the blogger. In a travel package of 3 Nights and 4 Days at least the 2 times meal should be covered. The winners who win also have to blog about their experience, no issues. But do you think anyone will write something really positive if things like lunch and dinner will also have to be spent by the blogger. I will request the team of BA to please think about it once. Well, this comment was not made to create any offense to BlogAdda or Club Mahindra, nor it will help me win a brand new Miami Blues sunglasses. But on behalf of all Bloggers who are writing for this contest, I will request the concerned team to do something on it. I mean just think, kai sa lagta hai, flights ke tickets diye but waha jakar khana bhi khudke paiso se khana pade. Everyone is putting their best efforts to write a blog post for this campaign. Make sure that some justice is done with the work done by the winners. https://fairytaleofasimplegirl.wordpress.com/2016/08/01/to-travel-is-to-fulfill-a-dream/ my entry for the contest…. Hey few guys on twitter are announcing winners of the contest. How is that possible? As its still one day left ? Hope my entry is valid and would be evaluated. I have just posted it. Is the contest closed? The submit button is not working. Is the contest still open for entries? 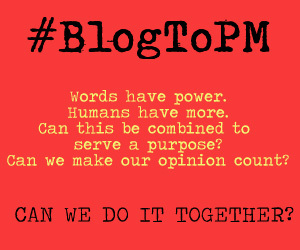 Need to write 2 new posts or can we submit recent entries on our blog? I long back submitted the entry but i cant find any winner announcements. Please let me know the status of it. Previous PostPrevious Collective: 10 Styles to Jazz Up Your Kurtis!